Written and directed by first-time feature filmmaker J.C. Chandor, Margin Call has taken quite a few months to reach Australian screens – which is a shame, as every increase in the stock market and every decrease in unemployment takes us one step further away from the impact of the recent recession, and thus, of the timeliness of movies such as this one, which examines the causes of The Crash through one, huge, fictional Wall Street financial services firm over one extremely intense twenty-four hour period. 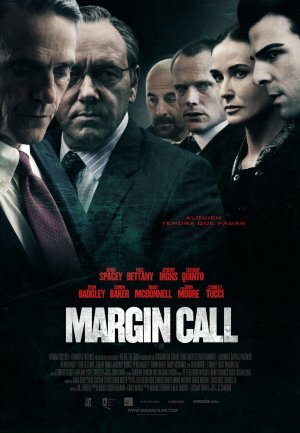 There’s no doubt that this delay will lessen the interest factor of Australian audiences for Margin Call, which is a terrible pity, because it’s an excellent, enthralling and revealing thriller. Chandor’s script was nominated for Best Original Screenplay at the recent Oscars, and his direction is every bit as slick, snappy, fluid and uncompromising as his words. It must have been that excellent screenplay that nabbed him his astonishing cast, because he certainly didn’t have a lot of money to pay them: the film cost only three and a half million dollars, though it has the feel of a much more expensive production – partially because of that cast, which includes (wait for it!) Kevin Spacey, Stanley Tucci, Jeremy Irons, Paul Bettany, Simon Baker, Mary McDonnell and Demi Moore, for good measure! All are extremely good in their roles, taking the difficult language of modern finance and owning it completely. There’s no doubt the film wouldn’t have happened without Zachary Quinto (Mr. Spock in the recently rebooted Star Trek series). Although there are nineteen credited producers or executive producers, Quinto really put the project together through his own production company. He also takes a role – essentially the lead, although it’s almost the definition of an ensemble picture – and is very good in it, keeping his own amongst his stellar cast mates. He’s obviously a very savvy player, and I’m positive we’ll see a lot more from him besides a bunch more Spocks. The film really places the trigger event of the Global Financial Crisis at the hands of a single firm (think Lehmann Brothers while you’re watching), but it also recognizes the inevitability of the thing: one of the firms was going to baulk at some point, and one of them did, almost demanding (in the completely insane world of titanic wall street firms) the others to follow. If you think you’ve “done” GFC movies – if you’ve watched Inside Job and Too Big to Fail – and are tempted to skip Margin Call, I urge you to reconsider. It’s a gripping, totally entertaining, classy movie, and well worth your time. Morten Tyldum’s adaptation of one of Norwegian literary superstar Jo Nesbø’s stand-alone thrillers (as opposed to his Harry Hole series) is a lot of fun, if you’re really willing to suspend your disbelief. 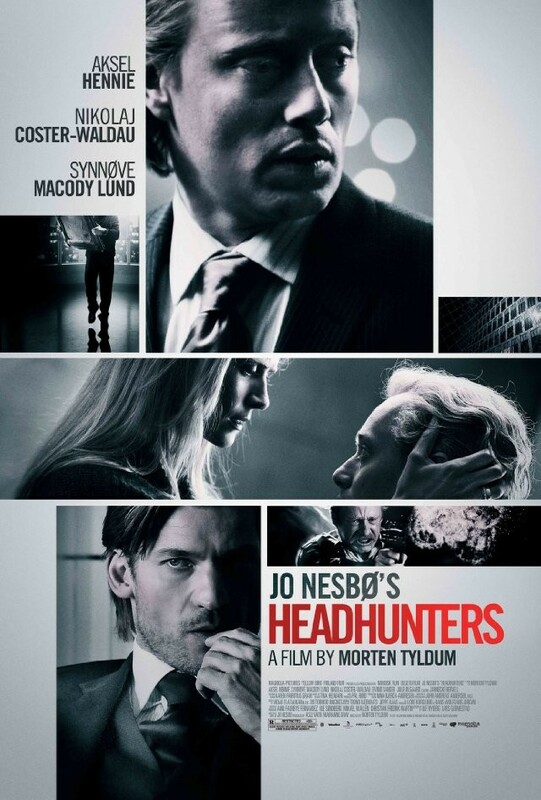 The initial premise is bonkers enough: a successful headhunter (Aksel Hennie, very appealing) is so worried that being shorter than his statuesque wife (Synnøve Macody Lund, very beautiful) will cause her to leave him that he steals paintings from houses, sells them and buys her expensive stuff with the proceeds. And it all gets more ludicrous from there. Fortunately, and greatly to its benefit, the film doesn’t take the material too seriously, and instead revels in a grim black humour. There are some excellent grotesque visual gags, and Hennie’s jovial portrayal keeps the whole thing light and joyful, even as the body count rises (and it rises pretty high). Nikolaj Coster-Waldau, as a slippery villain, is definitely in on the joke as well, playing his Clas Greve for every bit of posturing self-confidence and steely-eyed nefariousness as he can. He’s a dead ringer for American actor Aaron Eckhart, who would be very good in the role, and, odds-on, will be playing it in the extremely inevitable Hollywood remake.